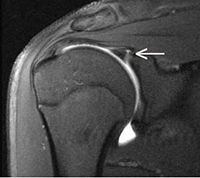 The labrum is a ring of elastic cartilage around the edge of the glenoid (shoulder socket). 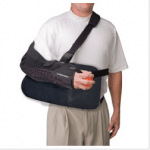 It acts as a container for the humeral head and essentially deepens the socket, wile creating a suction seal of the joint to increasestability. Labral tears may be caused by falls or collisions, often in sports. However, they may also be caused by repetitive activites or overuse. This type of repetitive injury is especially common in sports that involve throwing, swimming or lifting, but may also also occur in day-to-day life. Detachment lesions in the superior labrum, anterior to posterior (SLAP tears) are particularly common in overhead sports such as tennis or baseball. Symptoms of SLAP tears may include popping, catching or clicking within the shoulder, pain when reaching overhead or throwing, or simply a deep ache inside the should joint. Treatment of labral tears or SLAP tears almost always initially consists of non-surgical, conservative measures such as physical therapy, ice, anti-inflammatory medications and rest. If the patient fails to improve with conservative measures, surgery may be used to repair the torn portion of the labrum. An arthroscopic approach is almost exclusively used by Dr. Domb. In arthroscopic labral repair, the torn labrum is sewn back to the edge of the glenoid socket using sutures. Dr. Domb continues to research the most advantageous methods of repair, and his innovations have been published in the journal Arthroscopy, one of the most prestigious journal in Orthopedic Surgery.